Yes this is a message to me and anyone else who spends their free time overthinking about everything!! Stop!! Easier said then done? Of course; isn't that always the truth? So how do we stop overthinking? I find pinterest a good place to start. 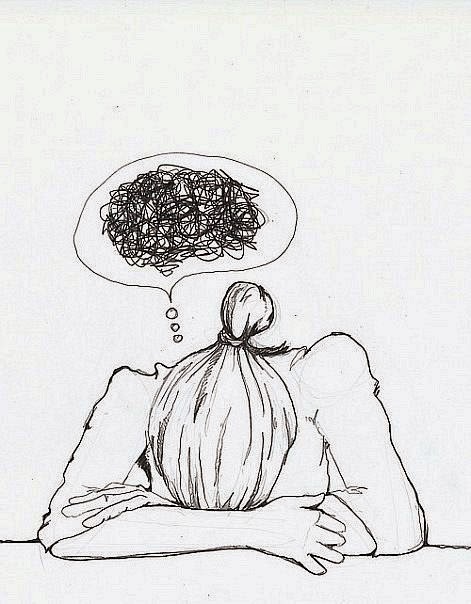 So I type: 'stop overthinking' into the search bar and lovely illustrations, quotes and articles of interest pop up. I do love pinterest. One picture grabs my attention and I follow the link to this blog post: how to stop overthinking everything = perfect! I love how the internet can connect you with what you need so easily. I like this idea. I think writing down what's on your mind in a way processes it. It makes you see your worries on paper and you can choose, to write down further notes about what you can do to ease these worries, or you could scrunch the paper up and put it in the bin. This visual activity of what your overthinking about could help you stop. Now I know breathing exercises helps many people but I personally do not find it so helpful. I don't like concentrating on my breathing and I get bored easily and do not take it seriously. So for me, I would change this tip to 2) Close your eyes and listen to music as this makes me sit quietly and focus on the moment. I think this is a good tip to try. We can often be hard on ourselves. I know I always think awful things about myself like, I'm not very good at this; everyone is doing a better job than me; I will always find easy tasks hard; what is wrong with me? I would never believe those things about anyone else so why myself? If I were to talk to myself I would say, you are better than you think; you have qualities that other people do not have; there is a place for you! The last tip is to do something. Instead of sitting there overthinking read a book, watch a film, write a blog post or do something to take your mind off things. Do you have any tips on how to stop overthinking?